46.50mm 18K white gold case with 80 baguette diamonds - 4.95 ct and 688 round diamonds - 8.07 ct, 13.65mm thick, transparent back with glare proof sapphire crystal, 18K white gold bezel, sapphire crystal crystal with plate, clear dial with flange in mother-of-pearl set with 44 baguette diamonds - 1.10 ct, caliber co 372 hand-wound movement with hours, minutes, approximately 90 hours of power reserve, white crocodile leather strap, triple folding clasp buckle with 104 Round diamonds - 0.84 ct. Water resistant to 3 atm. 46.50mm 18K white gold case with 80 baguette diamonds - 4.95 ct and 688 round diamonds - 8.07 ct, 13.65mm thick, transparent back with glare proof sapphire crystal, 18K white gold bezel, sapphire crystal crystal with plate, clear dial with 44 baguette blue sapphires - 4.71 ct and 44 baguette diamonds - 1.10 ct, caliber co 372 hand-wound movement with hours, minutes, approximately 90 hours of power reserve, blue crocodile leather strap, triple folding clasp buckle with 104 round diamonds - 0.84 ct. Water resistant to 3 atm. 46.50 mm 18K white gold case, 13.65 mm thick, screwed in open back 18K white gold with glare proof sapphire crystal, sapphire crystal, skeleton dial set with 44 baguette rubies (~ 4.73 ct) and 44 baguette diamonds (~ 1.10 ct), caliber CO 372 manual movement with hours, minutes, tourbillon, and small seconds, approximately 90 hours of power reserve, red alligator leather strap, triple folding buckle. Water resistant to 30 m. (Old reference 372.316.69/0F86 0000). 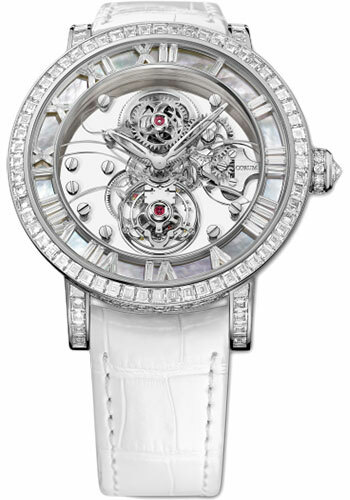 46.50 mm 18K white gold case, 13.65 mm thick, screwed in open back 18K white gold with glare proof sapphire crystal, sapphire crystal, skeleton dial set with 44 baguette diamonds (~ 4.15 ct) and 44 baguette-cut colored sapphires (~ 1.39 ct), caliber CO 372 manual movement with hours, minutes, tourbillon, and small seconds, approximately 90 hours of power reserve, white alligator leather strap, triple folding buckle. Water resistant to 30 m. (Old reference 372.310.69/0F09 0000).